All sorts of books have been written about the pro audio gear The Beatles used during their short but legendary career that gave the world 12 studio albums in merely eight years. From their use of Record Engineering Development Department (REDD) consoles with their distinct warm sound to the solid-state TG12345 console and its vast technical advances of the day, The Beatles were famous for taking advantage of the studio gear like no band had done before them. Today, almost 50 years after they split up, several companies are releasing new outboard gear and software plugins based on the equipment the fab four used back in the '60s, offering users the extraordinary experience of working in that same sonic space, but in a much more modern way. If you are looking for a warm and punchy sound, what you need is gear based on the all-tube REDD consoles. With a very limited production of three models, custom-made by EMI in the '50s and '60s, the consoles were famously used in all Beatles albums (except Abbey Road) and many other classics, including The Zombies' Odessey and Oracle and Pink Floyd's A Saucerful of Secrets. Buying one today is an almost impossible endeavour, but fortunately for us, Chandler Limited released a preamplifier based on the REDD.51: the REDD.47 mic preamp. They also sell the REDD Microphone, a large diaphragm tube condenser mic with the REDD.47 included. 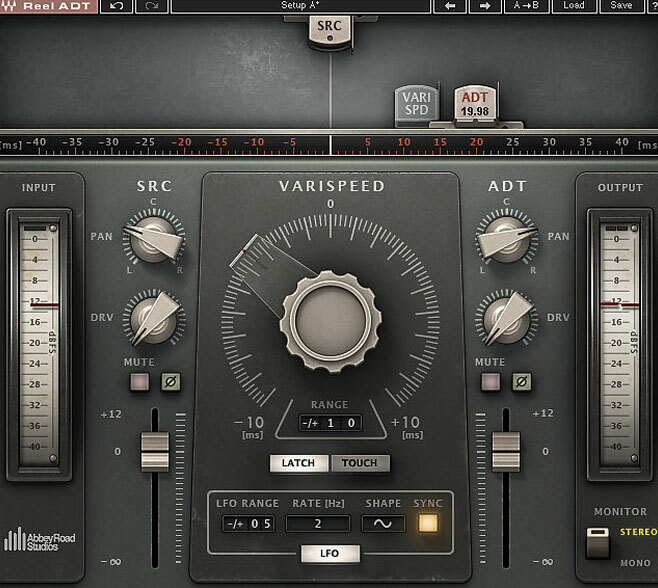 If you don't want to splurge, but you're still looking for that kind of sound, Waves' REDD plugin emulates the tonal qualities of the console and includes its famous EQ. 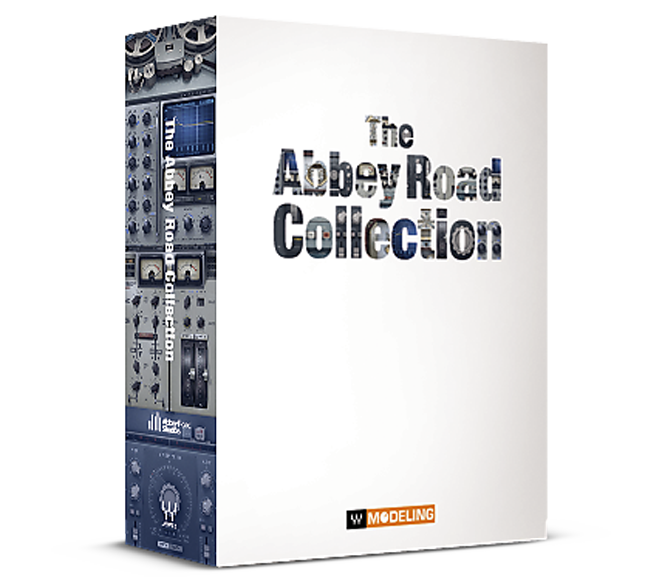 Another option is the Softube Abbey Road Studios Brilliance Pack, which includes emulations of Abbey Road's outboard EQ units often used to bring higher frequencies out in vocal takes. But what if you want the cleaner and rounder sound of the later Abbey Road album? The TG12345 was the console used in Abbey Road Studios in the late '60s and was a huge technical update from its REDD predecessor. It replaced the vacuum tubes for the solid-state technology and had 24 microphone and eight tape inputs. These improvements, combined with new tape machines, allowed The Beatles to record in eight tracks, instead of the four used before. The TG12345's characteristic sound can be heard in songs like "Something" and "Don't Let Me Down," timeless songs that helped give the console its historic significance. Chandler Limited has been releasing gear based on this console over the past few years. The 500 series has benefited a lot from it and now you can basically assemble a recreation of the console's channel strip by getting the TG2-500 preamp, TG12345 MKIV EQ and TG Opto compressor. If you have more space, or prefer them in the rack format, there's good news too: Curve Bender and Zener Limiter are based on the console's EQ and limiter, respectively, bringing modern improvements and making both units much more versatile than their predecessors. Want more? Chandler also offers the TG12411 Channel, a combination of preamp and EQ in the same unit; the TG Microphone Cassette, combining EQ, preamp, and limiter; the TG1 Limiter, and TG2 preamp/DI. Though these products are praised reproductions of the originals, and have even the seal of approval from EMI/Abbey Road Studios, they may be prohibitive for some. As an alternative, in the digital domain, Waves offers the EMI TG12345 Channel Strip, complete with preamp, EQ, and compressor/limiter emulation for a much more affordable price. And it was developed in association with Abbey Road Studios. If you are interested in the more experimental aspects of The Beatles, several plugins of the Waves Abbey Road Suite can help you get there without the mechanical problems and size constraints of '60s-era tape machines. 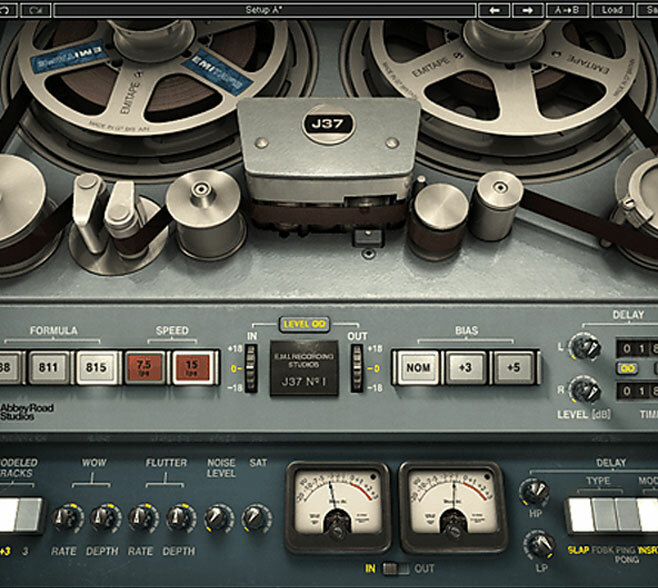 The emulator of the Studer J37 acts as a delay and tape saturation emulation, offering control over Bias, Wow, and Flutter, among other options. The ADT plugin, on the other hand, will help you achieve Lennon's characteristic vocal effects that involved using two tape machines to imitate double tracking with just one performance. The Automatic Double Tracking (ADT) was designed by Ken Townsend per John Lennon's request and can be heard in his vocals in "Good Morning, Good Morning" and the sitars in George Harrison's "Within You, Without You." Its ingenious sonic characteristics deserve their fair share of credit for helping Sgt. Pepper's Lonely Hearts Club Band achieve its masterpiece status. 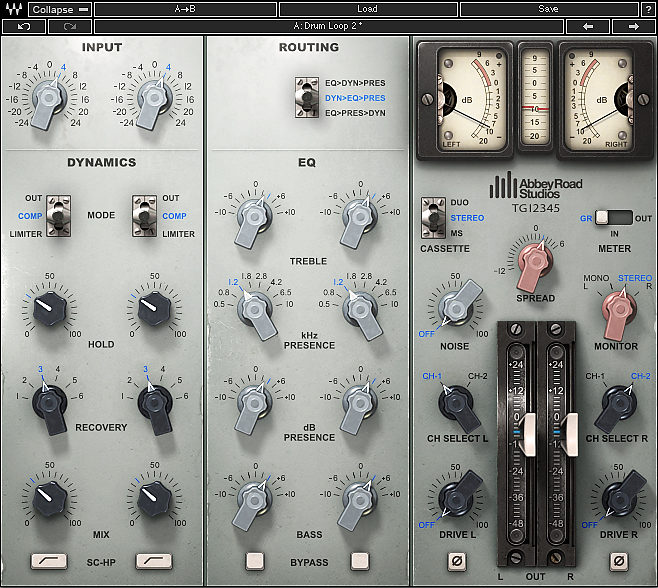 In addition, in the same set, the Abbey Road Plates (a modified version of the EMT-140) and Abbey Road Chambers offer emulations of the two artificial reverb methods The Beatles were using in the '60s. The most beautiful example of the use of chambers is in Lennon's vocals throughout the song "A Day in the Life." Beatles - "A Day in the Life"
Last but not least, another iconic piece of gear used by The Beatles was the Fairchild 660/670 compressor/limiter. This tube equipment was used on all The Beatles records since A Hard Day's Night and can be heard prominently providing smoothness to their vocals. To name a few of the available options today, the plugins by Waves (the PuigChild) and Universal Audio are very popular, detailed, and the most inexpensive choice. In physical form, the 500 series AM660 Limiter by Anamod Audio is a good small-sized option in a mid-price range, and the UnderTone Audio UnFairchild 670M II is the much more powerful and improved version in rack form—and the highest in price. The most popular band in the world tailored its classic but nonetheless modern sound using this studio equipment. In the process, it helped build their iconic status and made them a part of music's history. Most of this gear was revolutionary in its own right, pushing the boundaries of a still relatively new recording industry. Today, it's possible for engineers all over the world to benefit from their historic and improved advantages to keep pushing the envelope.